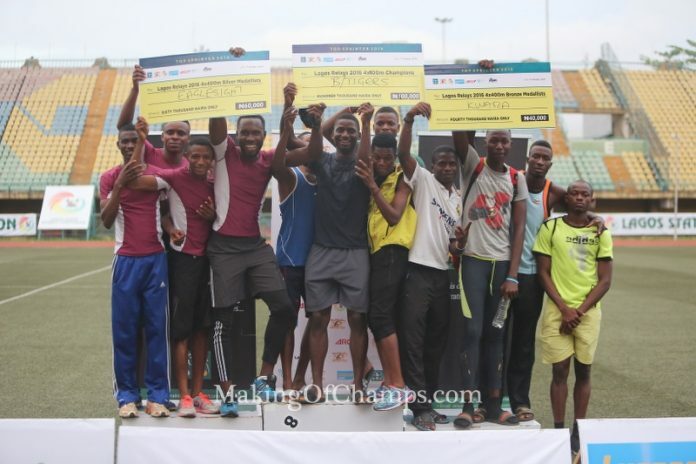 After three days of exciting and intense action at the Teslim Balogun Stadium in Lagos, Top Sprinter Lagos Relays 2016 came to a climax with the 4x100m and 4x400m relays across Youth, Junior and Senior levels on Independence Day, October 1. 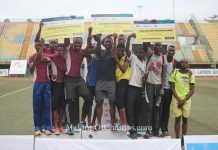 The Independence Day challenge was taken a notch higher by athletes who gave their all to ensure that they finished on the podium, considering the mouthwatering cash prizes that were at stake in the senior category of the relays. 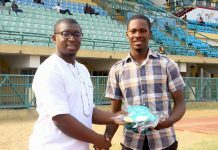 The relays took centrestage on the final day of Top Sprinter Lagos Relays 2016. 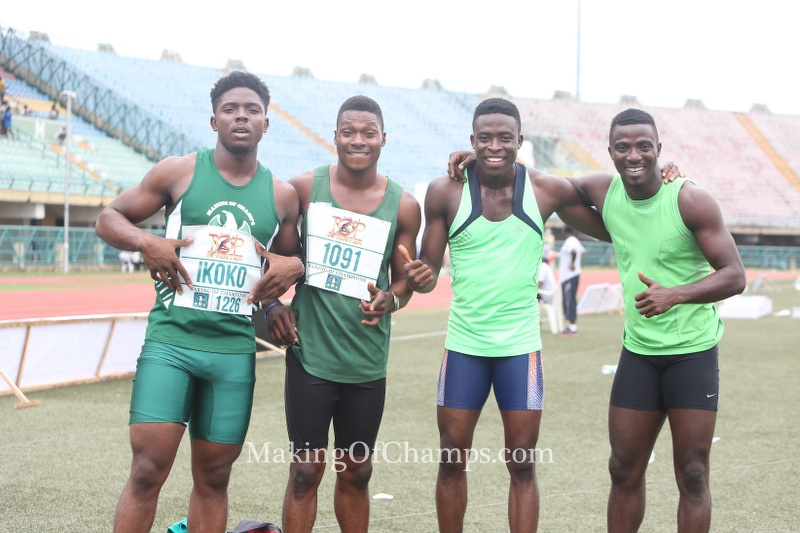 The men’s 4x100m was one of the most anticipated races, and Godspeed represented by Abiola Soyemi, Olamide Ajiboye, Emmanuel Arowolo and Onengi Ikoko raced to the title in 41.57s, with Ikoko running the anchor leg for the team. 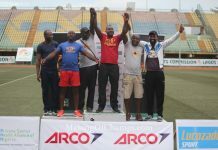 They were followed by the Kwara team comprising of Akintoye Adeyemi, Sikiru Adeyemi, Victor Peka and Hammed Yusuf who clocked 41.62s, while Team Emedolu’s quartet of Chibuike Egbochinam, Prosper Nwafor, Thankgod Igube and Chukwudi Olisakwe finished 3rd in 41.73s. 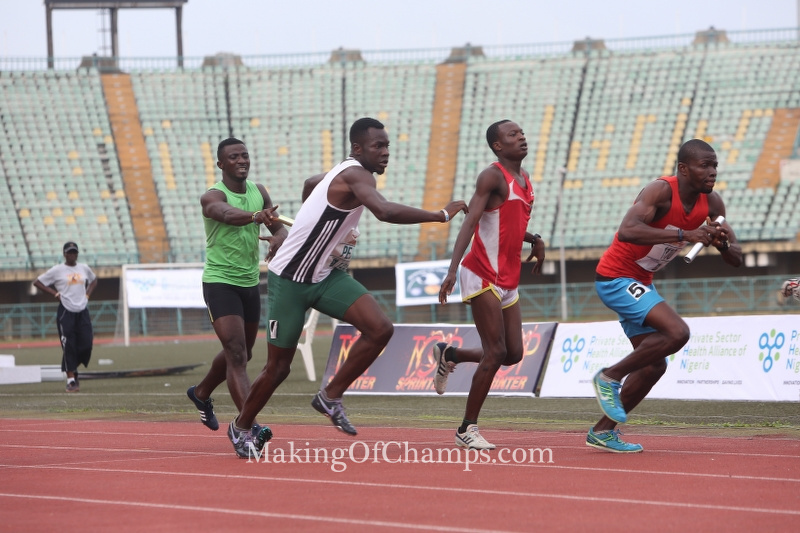 Godspeed’s quartet of Ikoko, Ajiboye, Soyemi and Arowolo won the men’s 4x100m relay. 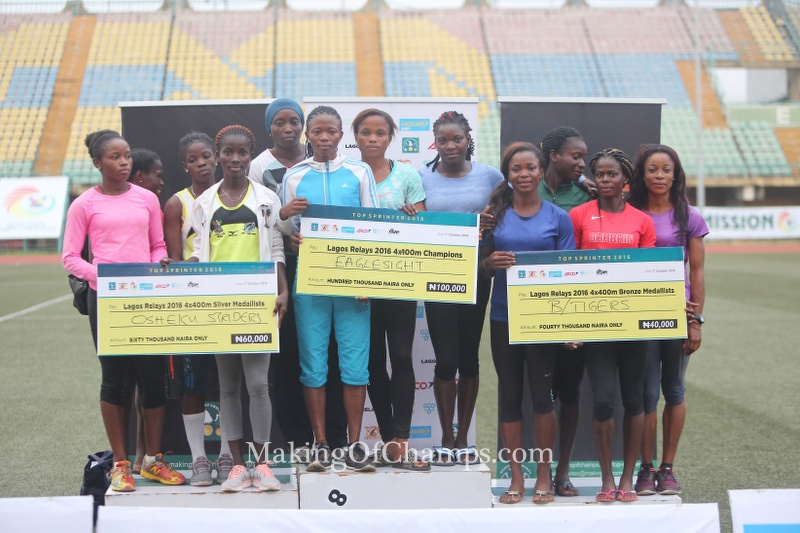 The women’s 4x100m relay was a perfect climax for Top Sprinter 2016 Double Sprint Champion Mercy Ntia-Obong who anchored the Cross River team to victory in a time of 46.57s, finishing ahead of Osheku Striders (47.50s) and Eaglesight (47.70s). 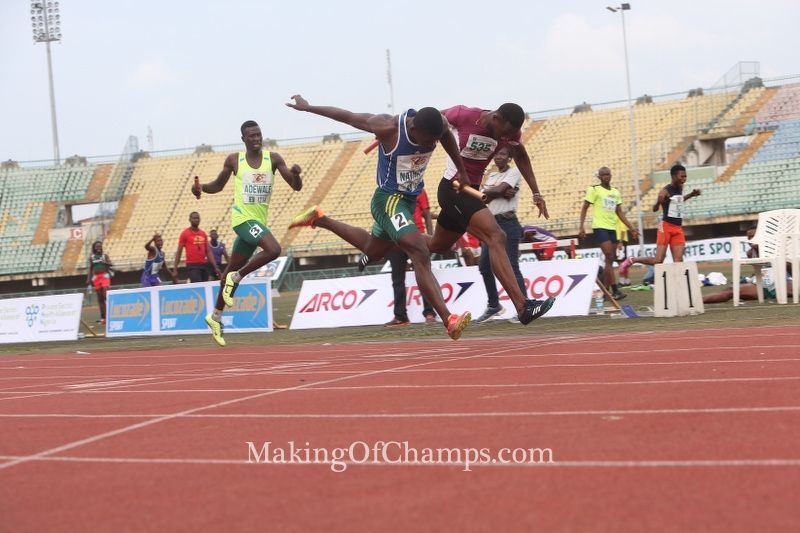 The 4x100m Junior Boys title was taken by Global A in 43.73s, while Making of Champions (MoC) represented by Saheed Jimoh, Segun Akhigbe, Christian Martins and Ese Oguma, placed 2nd with 44.32s, while Covenant University finished 3rd (44.49s). 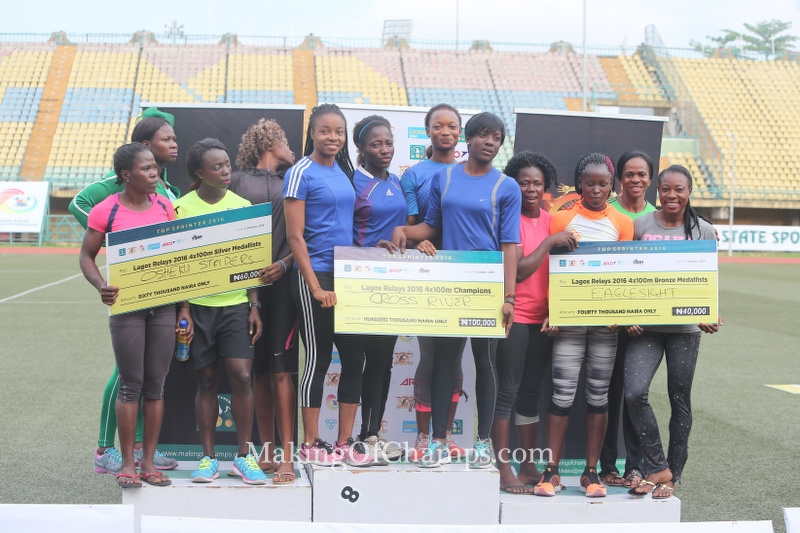 Cross River won the women’s 4x100m ahead of Osheku Striders (L) and Eaglesight (R). 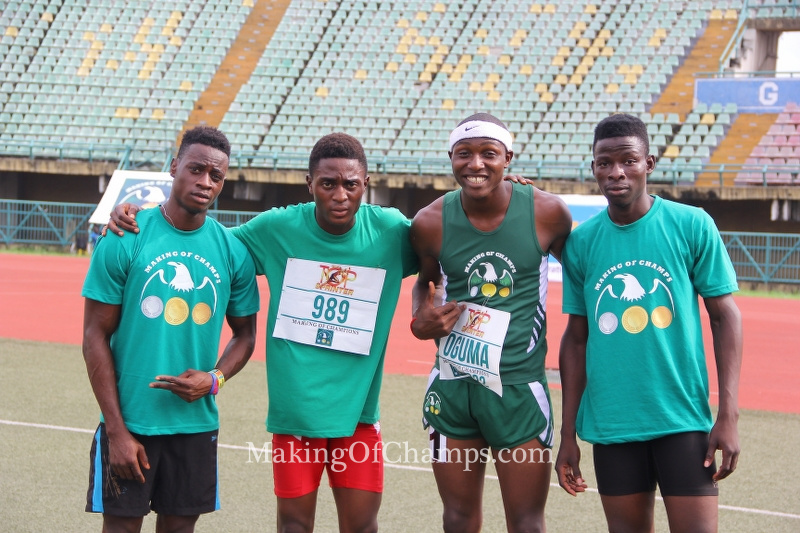 Tonero Club claimed victory in the 4x100m Youth Boys final in 44.51s, with Osheku Striders (45.48s) and Delta State (45.57s) placing 2nd and 3rd respectively. 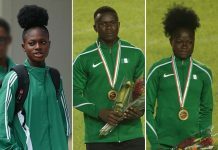 Samson Nathaniel and Yinka Ajayi replicated their feats from the individual 400m to the 4x400m relays as they led their respective teams, Buka Tigers and Eaglesight to victory on Saturday. 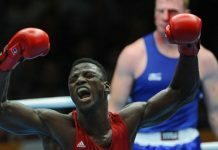 Samson Nathaniel pipped Sulaimon Badewa on the finishing line. 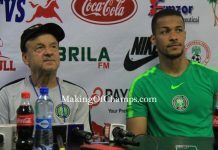 Nathaniel fought hard, leaving it till late in the race before dipping at the finishing line to deny Eaglesight B’s Suleiman Badewa a much needed win, running a time of 3:14.13, with the latter clocking (3:14.19). 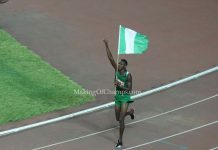 Kwara State was 3rd in 3:14.81. 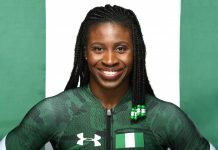 Meanwhile, Ajayi ran the anchor leg for her team to claim her second victory at Top Sprinter Lagos Relays 2016 as the team returned a time of 3:47.22 to finish ahead of Osheku Striders in 3:50.00. 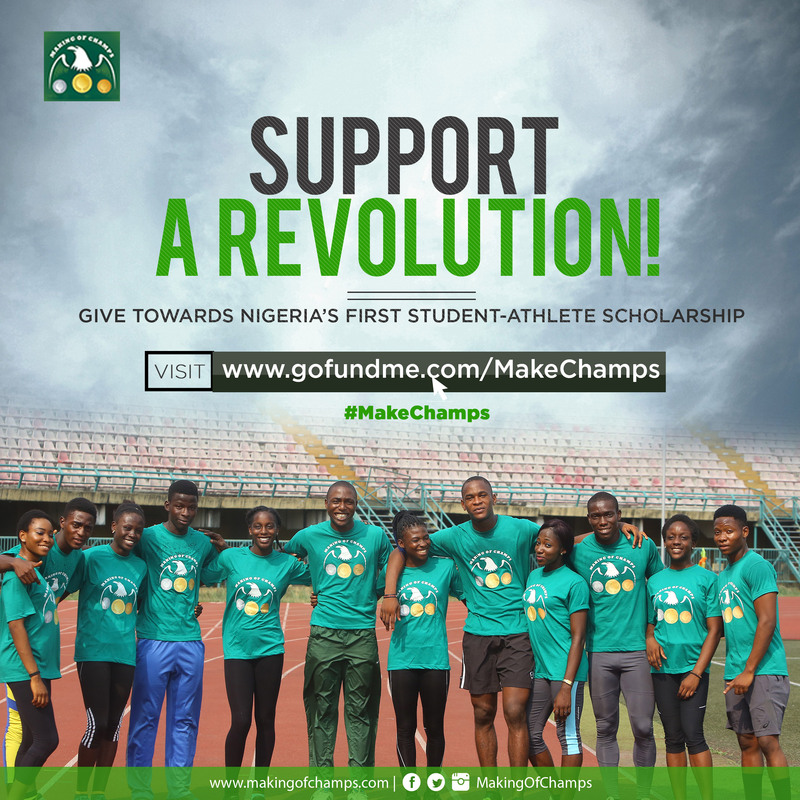 Yinka Ajayi led Eaglesight to victory in the women’s 4x400m. 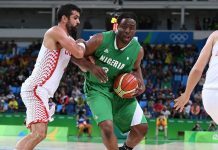 Knowledge Omovoh ran a very strong third leg to hand Osheku Striders 2nd position, as Buka Tigers lost the lead established by Glory Nathaniel to finish in 3rd place. 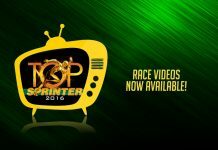 The Junior Boy’s race was won by Akhigbe Track Club in 3:26.69, with Team Delta coming 2nd in 3:34.59, while Buka Tigers placed 3rd in 3:41.47. MoC placed 2nd in the Junior category of the Boys’ 4x100m relay.